Magnetic Dry Erase Calendar for Refrigerator, Monthly Whiteboard Organizer Set 17" x 12"
With space for 5+ WEEKLY SCHEDULES, this refrigerator calendar helps you organize and coordinate your family daily activities. It makes all look so easy! Say goodbye to paper calendars full of cross out changed appointments and activities, so your monthly calendar just look a mess. Now you can have this wonderful dry erase calendar so you can make corrections anytime you need to. With your 2018 DRY ERASE CALENDAR you can write and erase whenever you want and you’ll see your magnetic dry erase board will remain 100% white, month after month. 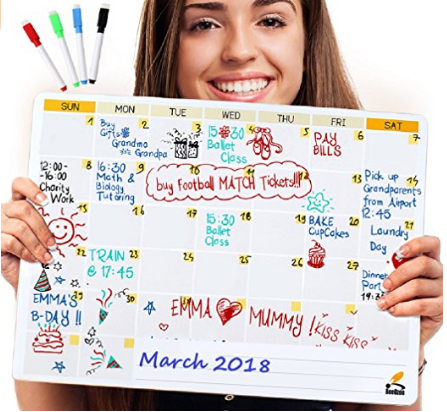 Enjoy the sleek design and friendly look of your magnetic calendar for refrigerator to list the monthly and weekly activities of your kids and spouse to create family cohesion and synergy. PREMIUM QUALITY MAGNETIC DRY ERASE BOARD of optimum thickness ensures a proper adherence on flat or curved metallic surfaces – you can put it in different places at home, as a fridge planner, on metallic doors and cabinets or in the office. A FREE SET of 4 COLORS DRY ERASE MARKERS also MAGNETIC - so you can place them right next to the monthly calendar planner. There is no way to lose them. Having a resistant hard tip, the markers leave a reasonably thin line and a clear writing. No problem fitting multiple events into a large single space, 2 sq. inches calendar box. You can use different markers to color code the kids' stuff versus yours. Great value for money, strong and lasting, practical and versatile dry erase magnetic calendar. ORDER yours today and you'll get it at the SPECIAL PRICE which is available only for a limited time period. If you are not satisfied with BEEOZON monthly calendar planner for any reason, we'll do whatever it takes to make you happy. We are here to make your life better.